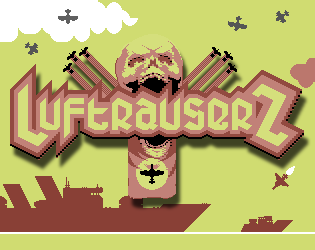 Here you will find also those handy emulators that let's you run all those C64 and Amiga stuff you can find here or anywhere else on the net. 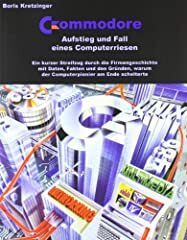 Additionally some tools for handling C64 and Amiga disk images, should provide you with all you need for homecomputing power on your (Windows) PC. Note: This emulator is designed for Windows 98/ME/2000/XP/Vista/7. 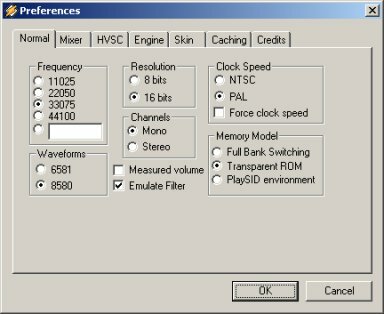 In order to be able to run CCS64 V3.0 you also need to make sure that DirectX V9.0 or newer is installed on your computer. 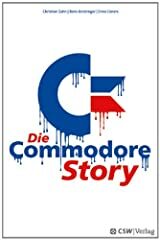 For further information visit: CCS64 Homepage. 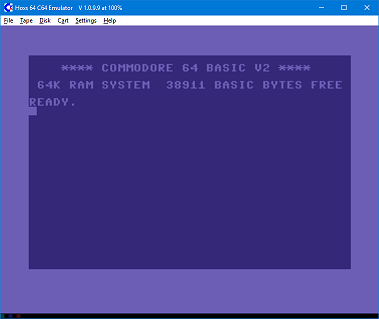 Nice and handy out-of-the-box C64 emulator. Works on Windows 7 and upwards. Just unzip and start. Note: The download here is the Windows 64bit (x64) binary. 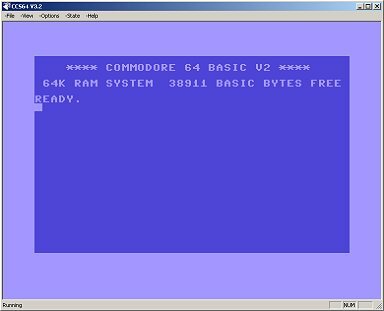 For 32bit version (or a version compatible with older Windows) visit the official homepage: Hoxs64 Commodore 64 Emulator. This is the predecessor version Vice-Emulator. I left it here for download for everyone who faces problems with the v3.x, like I do (can't get Ethernet with RR-Net to work). 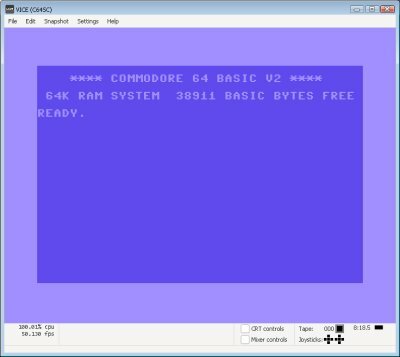 Note: The current version emulates the C64, the C64DTV, the C128, the VIC20, almost all PET models, the PLUS4 and the CBM-II (aka C610). The download here is the Windows 32bit (x86) binary. 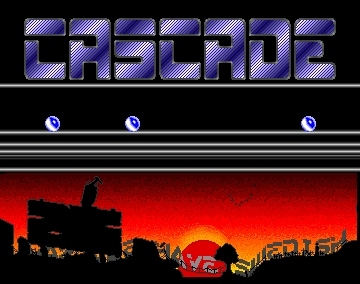 Versions for other platforms, source codes, documentation and additional information can be can be found on the following homepage: The VICE Emulator. This very decent d64 managing tool doesn't give the ability to transfer .d64-files from PC to C64 or back, but it is very helpful in editing .d64 files (it also can browse into the C64 'Lynx'-Pack-format). I mostly use it to prepare my C64 stuff with this tool, and then I transfer it via 'Star Commander'. For further information visit the 64Copy Central. 64 Copy is DOS-based (in the very known 'Norton Commander style') but also works in a DOS window under Windows OS. 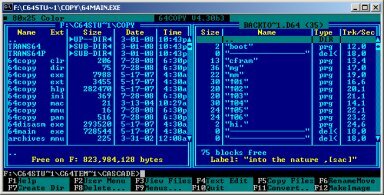 In case you use Windows 7 or upwards, you can also run 64COPY by using DOSBox. This is, as the title suggests, an (unofficial) Beta version of 64COPY. It was offered, because it is already capable of using .m2i format files (SD2IEC), which the v4.45 is not. More info about DirMaster can be found here. 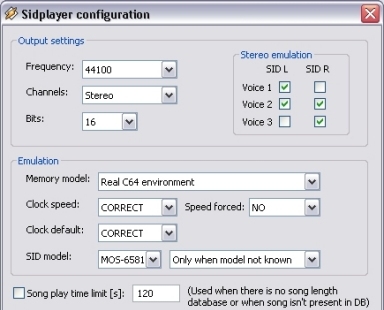 This is a sid plugin, based on "in_sidplay2" (see below), for the AIMP music player. Haven't tested this a lot (I still prefer rusty old Winamp) but it seems to work well on AIMP version 3 and higher. The offered file is zipped .dll, without an installer. You must de-pack and put the whole directory "aimp_sidplay" into the "Plugins" folder of your IMP installation manually. Another Winamp plugin, might be the best around, imho. This plug-in uses latest versions of libsidplay2 (written by Simon White) and reSID (written by Dag Lem) to emulate C64 sound chip. 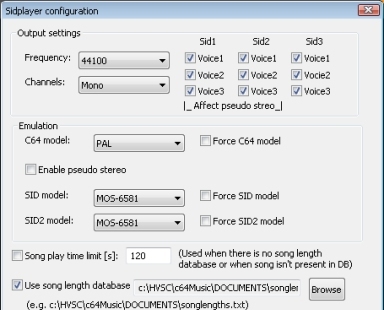 Supports: STIL info (available in file info window), song length database (tested with HVSC), seek through song - only with known song length! 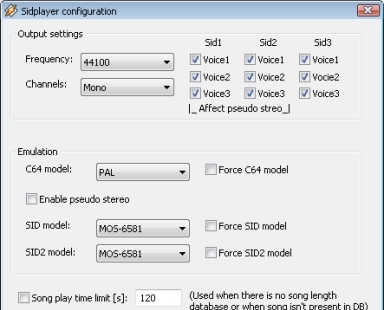 cpu intensive!, stereo emulation configuration (you can freely choose which voice will play on left and right channel). Subsongs are added automatically as new entries in playlist. More info here. 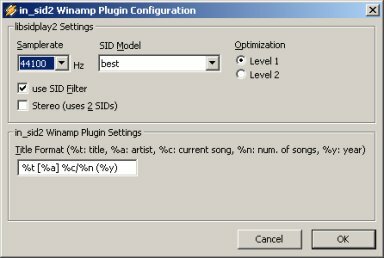 This is a newer version of the in_sidplay Winamp plugin (description see above). Works nice for me, but in case you face trouble, take version 1.5.4 instead. The offered file is just the zipped .dll, without an installer. You must de-pack and put it into the "Plugins" folder of your Winamp installation manually. This handy Winamp plugin enables you to play SID files with the famous media player alternative. 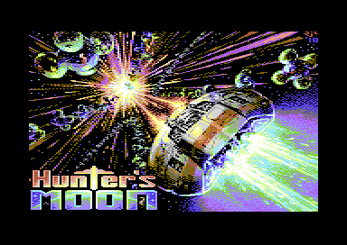 With Star Commander you can transfer disks from C64 to PC and vice versa. It needs a special cable, though. Program is only usable with DOS. 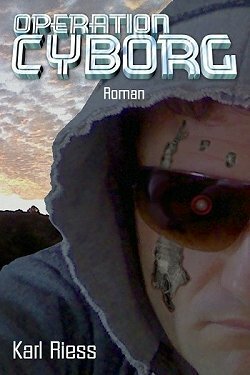 For further information visit the Star Commander Hoempage. 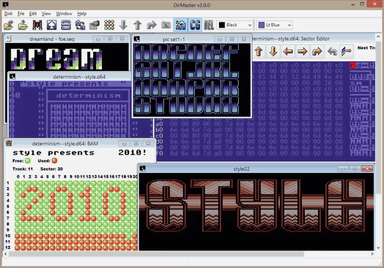 WinUAE is a mostly complete software emulation of the Commodore Amiga computers - from Amiga 500 up to Amiga 4000. Note: For this emulator you also need the original Amiga Kickstart-Rom-File. The Kickstart ROM is copyright 1982-1997 Amiga Corporation (formerly Hi-Toro) and its successors and licensors and we are not allowed to distribute it here. 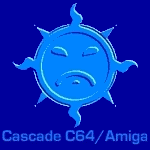 Officially licensed Amiga ROM and OS files are available both for download and on CD-ROM as part of Cloanto's Amiga Forever package, which includes Kickstart files up to v3.1 (the latest version). This is the 64-bit (x64) version. For the 32-bit (x86) and/or further informations about WinUAE (incl. older versions) visit: http://www.winuae.net/. 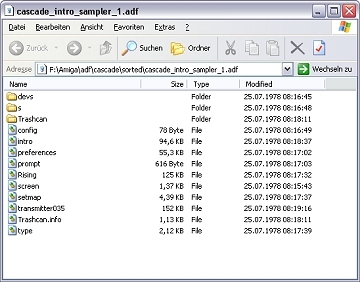 The ADF View is a Shell Namespace extension, which lets you open an .adf file within the Windows Explorer. In other words it shows the content of the virtual disk by double clicking the adf. disk image. Is told to work with Windows NT/2000/XP/Vista/Win7. For further information visit the ADF View website. 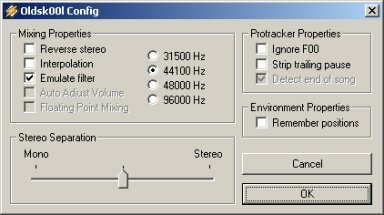 Though the new versions of WinAmp offer an implemented .mod plugin, you might want to try this little plugIn, because besides the wellknown Tracker format (.mod) it furthermore enables your WinAmp to play .fc3 (Future Composer) and .dm2 (DeltaMusic) files. AFR is a project (program + schematic circuit) to connect an external Amiga floppy drive to your PC parallel port, in order to transfer Amiga disks to their virtual pendants called .adf. This program runs in DOS only. For Windows version check WinAFR.